The color for the month of January is BLUE! Not dark indigo/navy blue, not baby pastel blue, just regular middle of the road blue. We will not be segregating the greenish shades of blue this year, so feel free to mix them in at will. I was a little worried at first about the greenish tinges, but I think it is adding some nice variety to my blocks so far. The inspiration collection above is the blue package from the Vicki Welsh Hand dyed snack pack. She sent one for me to use and one to giveaway. If you would like to be entered in the drawing for the blue fabric collection, please leave a comment on this post with your favorite word for blue. Mine is cerulean! Next year's sampler quilt will be just a bit more preplanned than last year's. 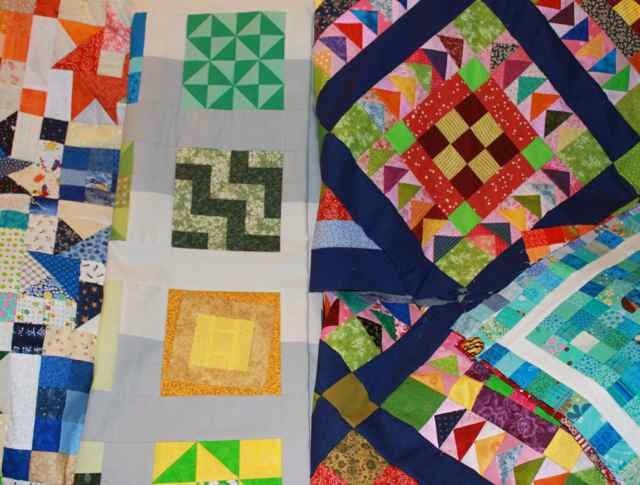 There will still be new 6 inch sampler blocks each month to include in your quilt, but each block will be set in a sawtooth star to match the color of the block. 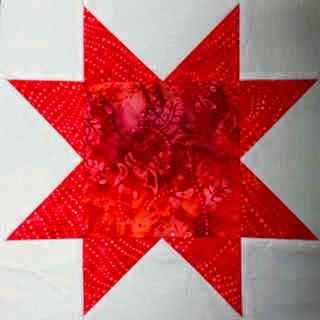 I'm writing a tutorial here for a general Sawtooth Star block to finish at 12 inches. Refer back to it throughout the year. 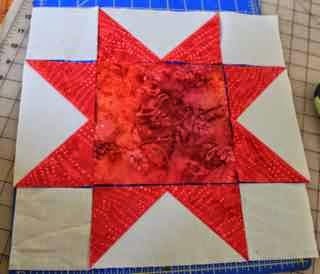 All you will need to do is make a 6 inch block as the patterns are posted throughout the year and insert one into the center of each star block. The Sawtooth Star is based on a flying goose unit. There are LOTS of ways to make flying geese blocks. If you have your own favorite, feel free to use it of course. As long as your geese are 6.5 by 3.5 unfinished ( 6 inches by 3 inches finished), you are good to go. My favorite flying goose method is using the companion angle and easy angle ruler. I like that it allows the use of the same size strips as for the corner units, which seems like a better use of fabric to me than cutting larger squares in half. So this sample block has a plain 6.5 inch square in the middle, but just imagine that it is a sampler block you have completed as part of the challenge. In addition to your 6.5 inch block, you will need 3.5 inch strips of star point fabric and background color. 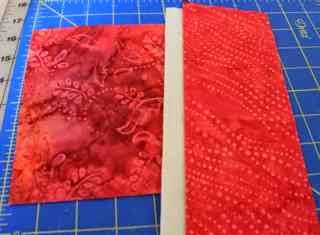 The star points should "match" the colors in the sampler block in that everything will be inspired by the color of the month. For this tutorial, we are pretending that pink is the color of the month. Don't take that as a hint of any sort, it is just the scrap fabric that was on top of the stack when I started my block. The background fabric will form the body of the goose block. 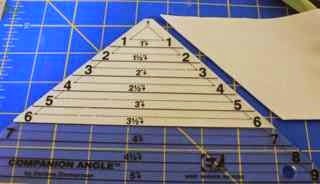 It is cut from 3.5 inch strips using the companion angle ruler. Cut 4 of these body units. 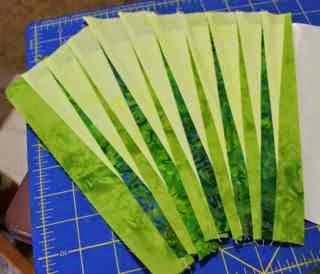 If you are going to be using a consistent background fabric throughout the quilt, feel free to cut some extras for later. 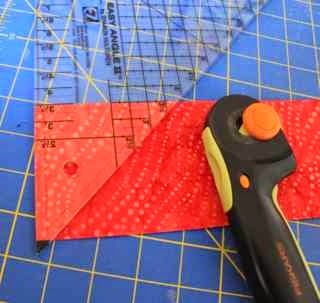 From the same strip you will also cut 4 - 3.5 inch squares. The points of the stars will also come from 3.5 inch strips, this time of the colored fabric of the month. Cut 8 triangles. Start by assembling your goose blocks. The star points get sewn first onto one side of the body units. Then onto the other. Press carefully and remove the dog ears. 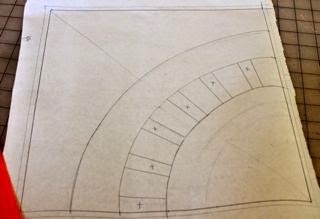 Here is the layout of the block. Four flying geese surround the center section and the background squares fill in the corners. Sew the rows together and press. The middle row seams iron to the center and the top and bottom rows are pressed out. 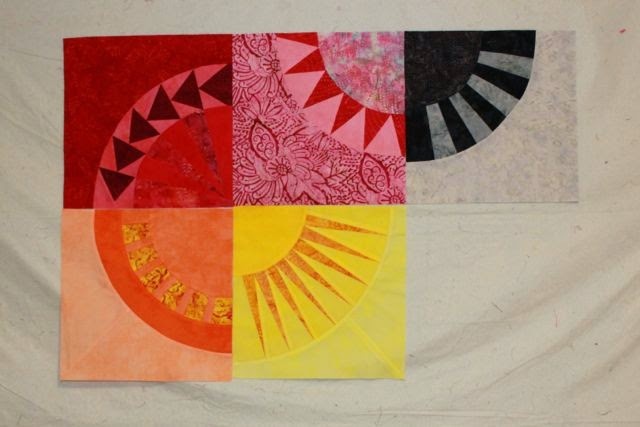 Your finished block should be 12.5 inches and will finish at 12 inches in the final quilt. 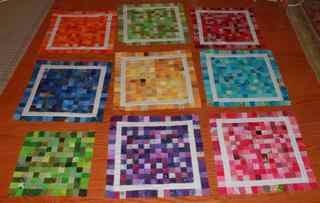 The center will be more interesting of course, after you have inserted your own sampler blocks each month. I'll be posting 2 or 3 new sampler block patterns each month, but don't feel obligated to do things exactly my way. How fun would these sawtooth star block be with a string block in the middle? Any 6 inch sampler block would work if you don't like my choice. Personalize this quilt as much as you like. I promise, it won't hurt my feelings if you deviate from the directions. I had seen a quilt with alternating light and dark horizontal stripes of sashing. It wasn't a Tula Pink City Sampler, but it had that feel, so I pinned it until I was ready to set my own quilt. 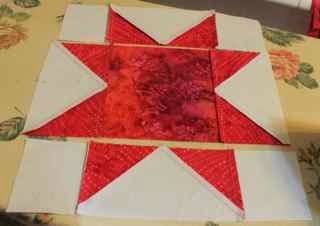 To do something similar, you will need two shades of setting fabric. I chose dark and light grey from Connecting Threads. The lighter shade is called parchment, and I think the darker one is silver. 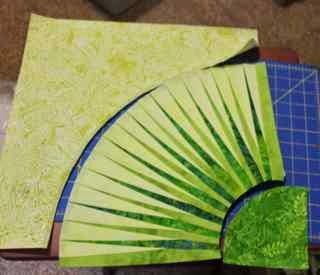 From those, start with strips that are 3 inches wide and sub cut these into 3.5 inch rectangles. You will need 90 of each color. 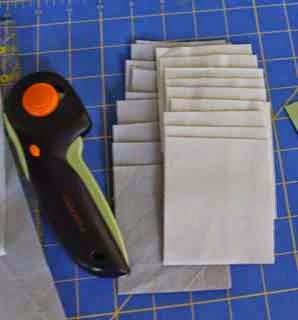 Sew them together on the short sides to make 90 sashing strips that are 3 inches by 6.5 inches. The key to the split stripe effect is that the sashing strips alternate with each row. The top row has the light part facing down, the second row has the light part facing up. After you put a light row on the horizontal, it looks like the blocks are floating in the middle of a white stripe. The easiest way to do this is to think of the rows as odd and even. Odd rows have light down, even rows have light up. The horizontal sashing strips are also 3 inches wide. To get them long enough, you will need to sew two strips together. Measure the length of your rows after the vertical sashing strips are sewn in between. The math says they should be 83 inches long at this point. I went with the math, because with sampler blocks, there can be minor size variations. The most important part is that all of the sashing strips need to be the same length. It is a bit tedious to sew so many long strips, a bit like a quilt with 8 borders really, but sometimes tedious is worth it. The final borders were easier for the top and bottom than for the sides. 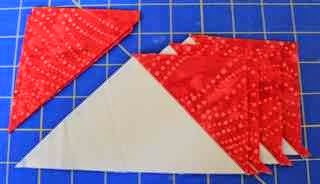 These are slightly wider than the inner sashing, so cut your strips 4.5 inches. Sew two strips together and trim to 83 inches. Do this for the the top and the bottom of the quilt. All that remains are the two side borders. The middle sashing strip is now 2.5 inches finished. Each block is 6 inches finished, and you are spanning half of two blocks. So, 6 inches plus 2.5 plus .5 for seam allowances should mean 9 inch strips. The top and bottom are just 7.25 inches because they only span half of one block plus the bottom border. 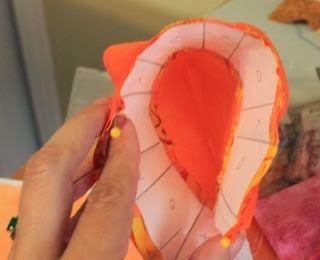 Sew the strips together with alternating light and dark and lay them out to make sure everything lines up just right before you pin and sew. 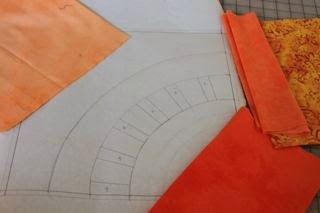 I so admired the orange peel quilts that have been going on, I just needed to start my own. Sound familiar, right? So I've got a little orange peel assembly line going on. 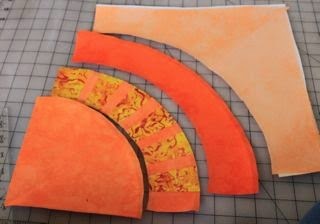 I cut a little stack of orange peel templates out of freezer paper using a pattern that I found here. 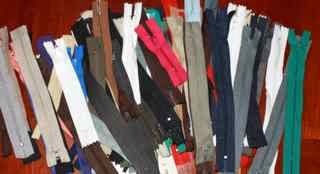 Those get ironed on to scraps as I find them and rough cut until evening TV time. It's pretty easy to trim them out with a quarter inch seam allowance. I turn the edges under using the technique that I found here. Next time I'm at the ironing board, it doesn't take long to glue baste them to 5 inch squares all ready to go into the busy bag. I'll start on the blue block for January and then pull out whatever stack matches the rainbow scrap challenge color of the month. 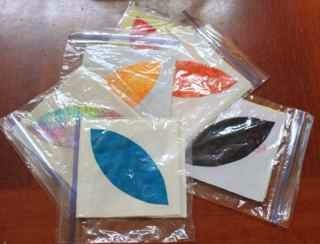 We have a car trip coming up, so these blocks in a bag should come in very handy. It is hard to believe that another year has almost gone. Despite all my scrap using efforts these past 4 years, I still have plenty left to use. So if you are new and joining in for 2015, welcome! We are happy to have you join. Feel free to introduce yourself and let us know what you have planned for the RSC15. If you are already part of the rainbow scrap challenge, please share your accomplishments from the last year. Feel free to brag just a bit, we'd love to see your rainbow scrap projects and know what is in store for next year. I must confess that I have already gone into full preparation mode for 2015. 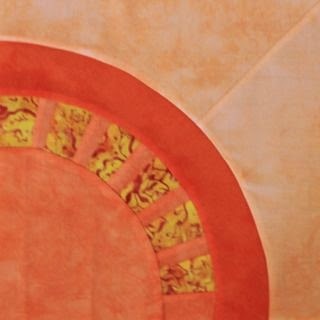 One of my new projects is going to be an orange peel quilt. I do pretty well with applique as long as it is prepped and ready to go. 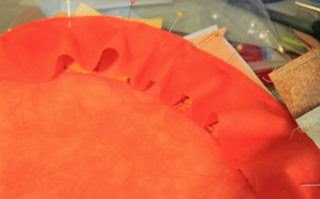 So as I've been finishing New York Beauty blocks lately, each fabric gets put aside for an orange peel. I'm saving each color in its own little baggie, so as the colors come up, I can pull out a baggie and begin to sew. This block should be called, "Not Quite as Planned". I started by drafting a very spiking New York Beauty with dimensional points tucked behind the main points. I marked every five degrees and started drawing. I thought it turned out pretty well. 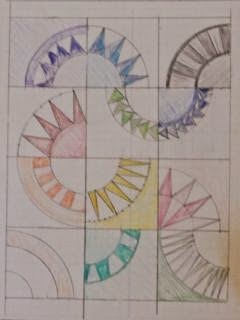 Anna and Sydney helped choose the colors, rejecting the more ocean colored greens in favor of the lime variety. The greens are both hand dyes by Vicki, and there is a batik for the darker spike. As soon as I started to sew, I realized that the whole spike behind a spike idea was not going to work. I've done enough paper piecing that I should have recognized inset seams in the design. No problem though, I am adaptable, alternating spikes are almost as cool as dimensional spikes, right? So I sewed and trimmed, and ironed. After the spikes were done, I trimmed out all of the pieces and sewed them together. Not my best curved seams, but they came together. As I laid it out for final squaring up though, I couldn't figure out why the edges weren't quite working out. Apparently I drafted the original template at 15 inches instead of 12. Really? How could I not notice such a thing? So the angles are a bit wonky, but after sewing all those spiky points, there was no way I wan't using this block. Maybe I'll move it into the corner of the quilt. Here it is added to the collection so far. I think double flying geese are next on the list. Hope you are all enjoying your winter holiday time. I went with Sydney and her friend Bethany to see Into the Woods yesterday. It was a lot of fun. Sydney and Bethany wanted to sit alone together though, so I sat with Bethany's family. Kurt made prime rib on the green egg for dinner. It was the first time he tried it and it was delicious! We will have to try that one again sometime. This morning I took the girls shopping for some fancy cruise dresses. Kurt and Ryan went to volleyball and got haircuts. Now they are all scattered allover the neighborhood playing with friends. I feel sleepovers coming soon. And the stockings were hung by the chimney with care. Today we made Christmas pajamas. 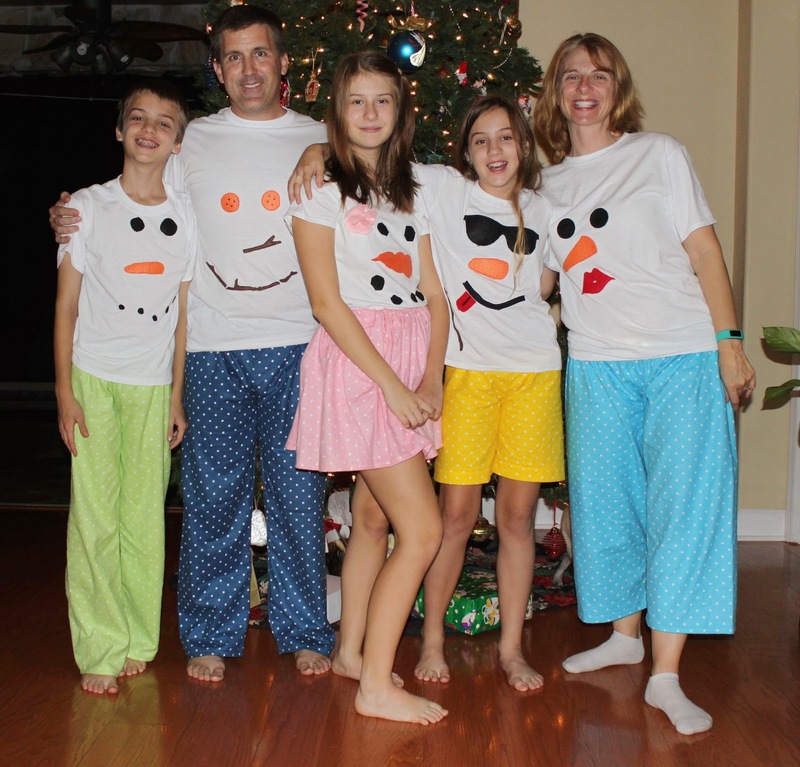 Everyone picked out their own color and style for the bottoms and then cut out the shapes for snowman face. We are all watching Christmas Vacation together and getting ready to set out the milk and cookies for Santa. I thought I would sew the day away today. I did get to sew, and also go to piano lessons, the grocery store, wait for the home inspector, go power lifting and collect water samples for science fair. So I guess that is why it took all day to make this one block. Totally worth it though, right? These point are 18 degrees and split down the middle. That meant marking every 9 degrees. I have become really good friends with my protractor. Best of all, I even learned which one is the compass and which one is the protractor. The dark, medium and light solids are hand dyes from Vicki Welsh. I added in two batiks from Connecting Threads. I really like the speckled fabric in the points. Kurt thought the floral in the small circle was too busy, but I like the overall effect. So that brings the total up to 6. Maybe I can make the green block tomorrow. The end of the year is such a nice time to take stock on ongoing projects. I spent a good deal of the afternoon tidying up projects to figure out which ones will continue to next year and which ones I should try to finish up now. The giant postage stamp quilt is almost done. I just need to add the lattice and cornerstones around the border and then do a nice ironing job on the lot. I still have scads of postage stamps, so I'll try to finish off the smaller version of the same blocks next year. I finished off Mai Tai Sunrise with rainbow nine patches this year. There are, of course, lots of extra nine patches though, so I was trying out new patterns for those. Such fun! 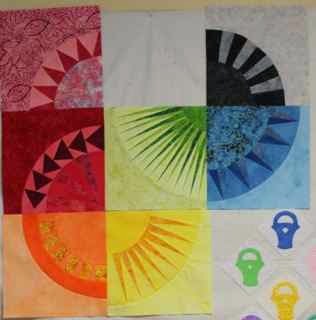 I think I am going to do something similar to the baby quilt that Bonnie Hunter just finished. I tried it out this afternoon and I think it will work beautifully. These applique baskets have been going on for a while now. 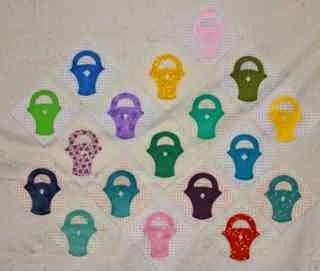 I want to start an orange peel quilt this year though, so finishing off the baskets is now at the top of the list. I think I have enough already prepped, it is just a matter of putting them in the ready bag so they can come along for the next quiet moments of waiting. I am picturing small lattice strips for this in random bright colors with plain large setting triangles. As a sign of my dedication to getting it done, I'll leave it up on the wall until the last blocks are done. Do you have any handwork projects in the works? 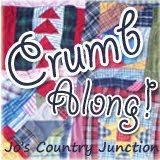 Check out Kathy's Quilts and Handwork Sunday to admire all the slow stitching going on in blogland. I didn't get much sewing time in on the first day of winter break. We were working on PVC frames for science fair boards which took trips to Lowe's and Home Depot. Kurt has everything cut for me and I'm about halfway done with the glueing. 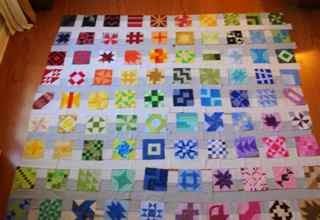 The giant postage stamp quilt is my first goal for the break though. I finally decided to use four patches as cornerstones, which meant a slightly wider lattice strip than I had originally envisioned. That, sadly, meant that I am now out of Kona white with 9 strips still to cut. Maybe I'll shift everything to the center and add the outer border later? Now that I think about it, I could even use a slightly different shade for the outer strips to achieve a faux border effect. I think that might work. I love blogging as a way to work things out logically. Problem solved with no shopping required. So nice given the traffic yesterday. Frightening! Last night we went to a Christmas party with some of Kurt's work friends. 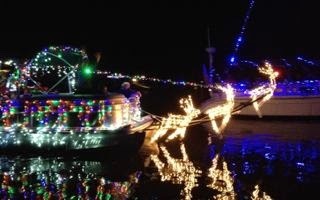 They live on the water and so we enjoyed a boat parade past his back yard. This float was the kids favorite. The reindeer took turns lighting up to give the illusion of flight. Kurt and the kids have gone to see the new hobbit movie, leaving me alone to sew madly. Vacation! 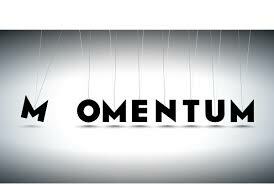 Such a beautiful word. As the end of this year approaches and a new year gets ready to begin, it is time to take an inventory. 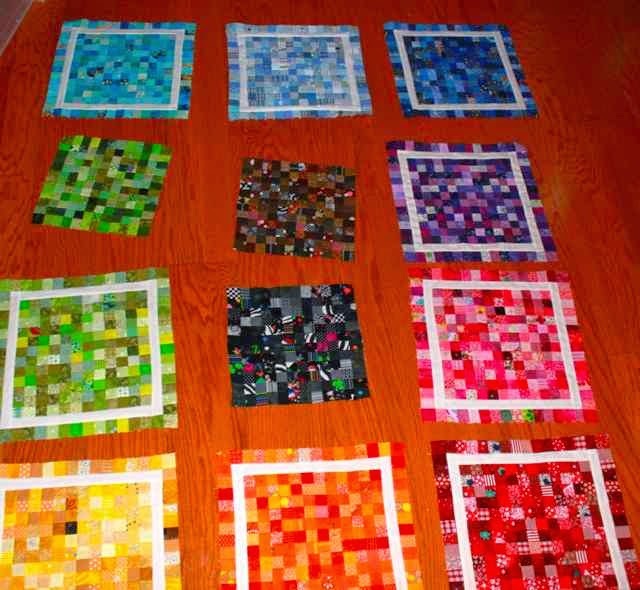 Quilts to finish this year, quilts to carry over to next year, and quilts to start anew. Here is my stack to finish this year. I will carry over baby nine patches and little postage stamps. Starting anew, well that is the fun list. The new sampler of course, the new New York Beauty blocks which are just slightly started, some tiny split string blocks, and maybe an orange peel for hand work. What is your list looking like so far? The linky below is for any Rainbow Scrap Challenge related updates. Let us know how your plans are progressing. Yesterday was a supersize day and a half. Finishing up exams is greuling, science fair is in full swing, and Christmas festivities are frantic. I came home exhausted and collapsed at 9 something. Passing out at 9 something came with waking up at 4 something, and I felt like getting some work done. So here is New York Beauty block 5! Very sunny, right? Look at the spark that it adds to the NYB wall so far. Who knew I could do that? I sure didn't! 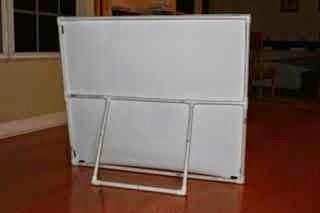 I have been officially tasked with construction of new science fair boards for next year. We've been using these giant wooden tri-folds. This year we got a big fancy printer though, and these PVC frames are supposed to support the printed posters at fair. It should be much easier to transport. Kurt did the cutting, 'cause I'm a little terrified of large power tools. I've just been doing the assembly at school between exams. So, 15 down, 45 more to go. Speaking of count downs. LAST DAY before winter break. Just two exams today and then finishing the grading and the last minute odds and ends. Yahooo! As close as it is to the end of the semester, busyness still prevails. Today was a social after work and then a singing performance for Sydney. Nobody came for lego practice though, because of exams. So here are just a few points for my next New York Beauty block. One seam at a time. I thought I would whip up three blocks on Saturday, leaving Sunday open to work on my new sampler or NYB blocks. Not quite. The three postage stamp blocks somehow took all of the weekend. I also did lots of scrap sorting and cutting. All that remains is to add a border to the last few blocks and then figure out what to do with sashing. I was thinking of white, grey white stripes with nine patches in the corners. It might be too much though. 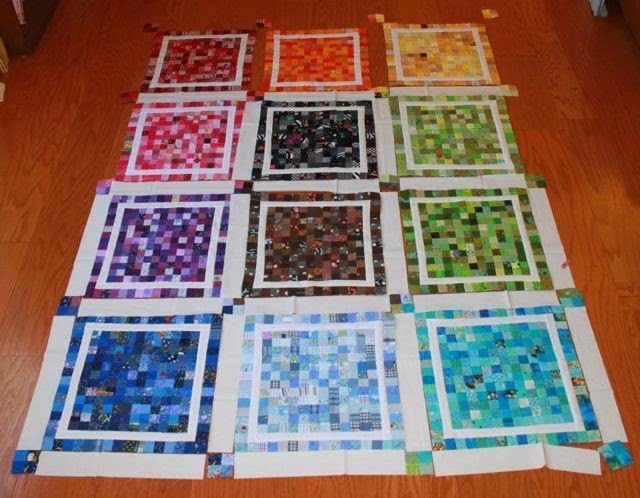 I always think that I want rainbow cornerstones on rainbow quilts, but I never end up liking the way they turn out. Maybe I just don't have the right rainbow fabric. It is the last week of school before winter break and exams started today. Serious crunch time for the kids, but I've been catching up on lots things while they played review games. 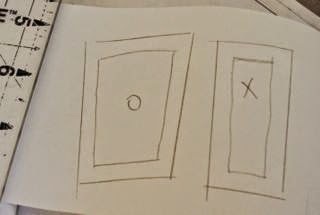 Yesterday was catchphrase and today was pictionary. My file cabinet is no longer overflowing, and I am almost out of piles of papers to deal with later. Almost. This is the week for one last push to the finish. If you are at all like me, not everything is going to get finished this year. I did dig out this one last project that I think is within reach for 2014. I missed three blocks along the way, mainly due to lack of fabric variety in the scrap stash. The light blue is almost done, I just need to add a black/grey block and one more in browns. 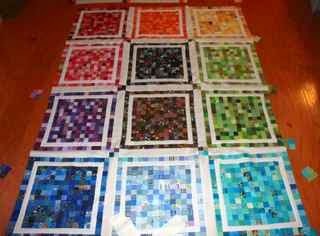 If I can find enough scraps in those colors, this postage stamp quilt will be pretty quick to finish. Then I can jump back into getting ready for next year's projects. I've been having SO much fun playing with my snack pack and getting ready for the challenge quilt next year. 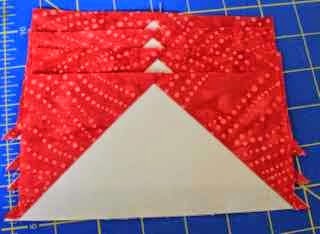 I wish I could show you the beautiful blocks I have already made with Vicki's fabrics, but the January posts are already scheduled, and February is on the list for this weekend, so it won't be long now. Add that to my new addiction to New York Beauty inspired blocks, and a plan for a new string project next year, and you can see why I really should finish off some of the already started projects that are on my list. Misterlinky is below so we can all see how the begining of the end is going for you. 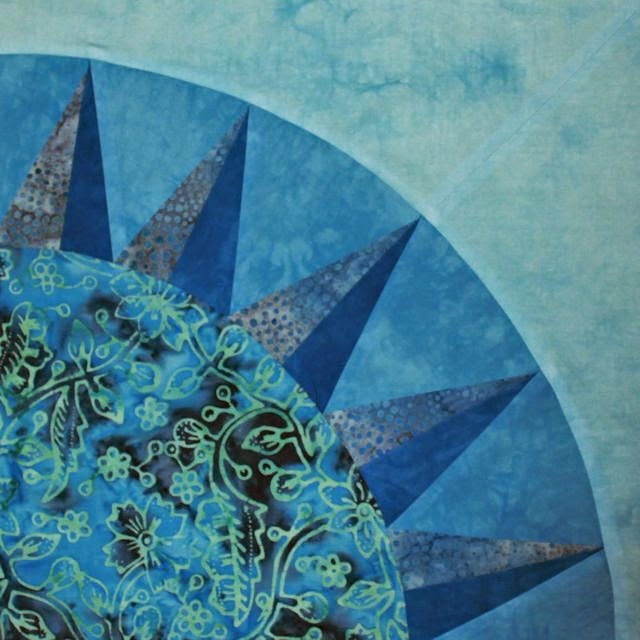 It has been exciting for me to start seeing all the beautiful finished quilts popping up. Great inspiration for next year and maybe a few more after that! 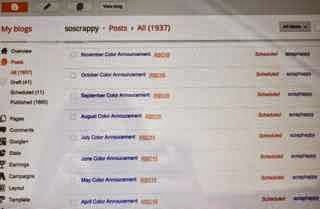 Over Thanksgiving I was browsing on E-bay for zippers. I had so much fun making little zipper pouches this summer, but was surprised at how expensive zippers were. Usually $1-$2 EACH! So 100 zippers for $7.99 plus free shipping sounded much better. 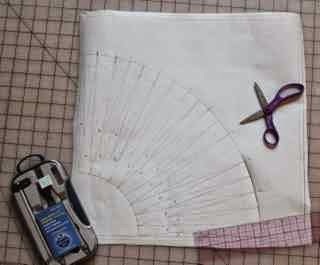 I'm on a piecing roll right now, but as soon as it takes a pause, I would love to make some more nifty zipper pouches. The kids loved the earbud pouches, and I keep putting charging chords back in the mini box pouches, and I am getting a lot of use out of my two big boxy pouches, one for sewing supplies and one for travel bathroom things. The girls are off making caramel corn. They are using the recipe that Amy posted. It smells heavenly! The girls wanted to go to Joann's this morning. They are working on Christmas gifts for one another and needed some supplies. Can you believe that I went to a fabric store and came home empty handed? I actually need to get some Kona Cotton slightly darker than silver grey to bind the Rainbow Scrap Challenge Sampler Quilt 2014, but I didn't feel like waiting in the Sunday cutting line for just that. We did get lunch out though, so it wasn't a wasted trip for me. I came home anxious to try out another New York Beauty Block. Curved piecing was not my friend on the last block, and I was determined to do better this time. So the pattern is drawn out on freezer paper, which is big and cheap and even ironable. I drew arcs at 10, 8 and 6 inches for this block and inserted wedges into the inner arc that alternated between 5 and 10 degrees. I bought a fancy new compass to try out, but it didn't come with instructions and I couldn't figure out how to use it. True story! Edited to add: I did a search and found some instructions for how to use an extension bar on a bow compass like the one I bought at Hobby Lobby. I like the keep track of things like that in case I ever want to know later. So I'm off to try the next block with my fancy new tools. So I used the easy and cheap pencil on a string method again. Worked flawlessly. The fabrics for this quilt are a batiks mixed in with hand dyed fabrics from Vicki Welsh that I have been hoarding for too long waiting for inspiration. 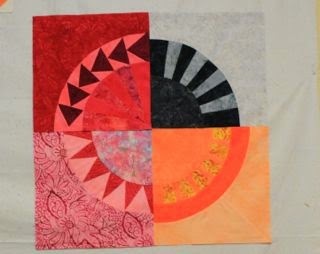 For this block, I pulled the oranges from color wheel packs in light medium and dark. 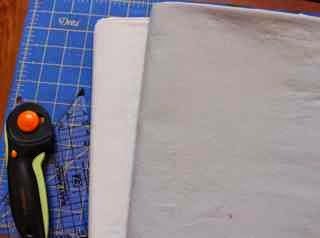 I traced the wedge segments roughly onto freezer paper and added a quarter inch all around for seam allowances. I didn't cut the shapes exactly, but at least I wanted to know that they were at least big enough to fit. 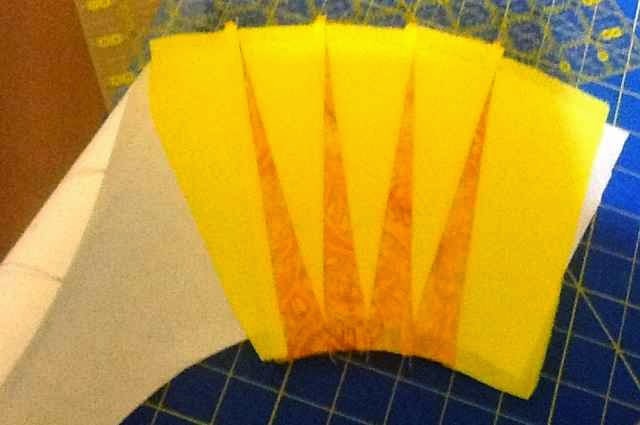 The pieced arc was paper pieced, but the other three pieces were just ironed onto the freezer paper and trimmed with a extra quarter inch on the edges for seam allowances. I also left an extra quarter inch outside for "just in case"
So I am starting to realize, that although curved seams don't fit together when the pieces are placed right sides together on a flat table, they do match up nicely in 3 dimensional space. So I worked with curving the pieces and pinning first in the middle, then on each end, and dividing each segment in half again until everything seemed secure. So it looks like about 8 pins for the dark orange arc. I know some people are able to do this without pins, but this is what worked for me. Here is the finished block. TaDa! And here are the first 4 blocks on the design wall. Keep in mind they won't go together like this. 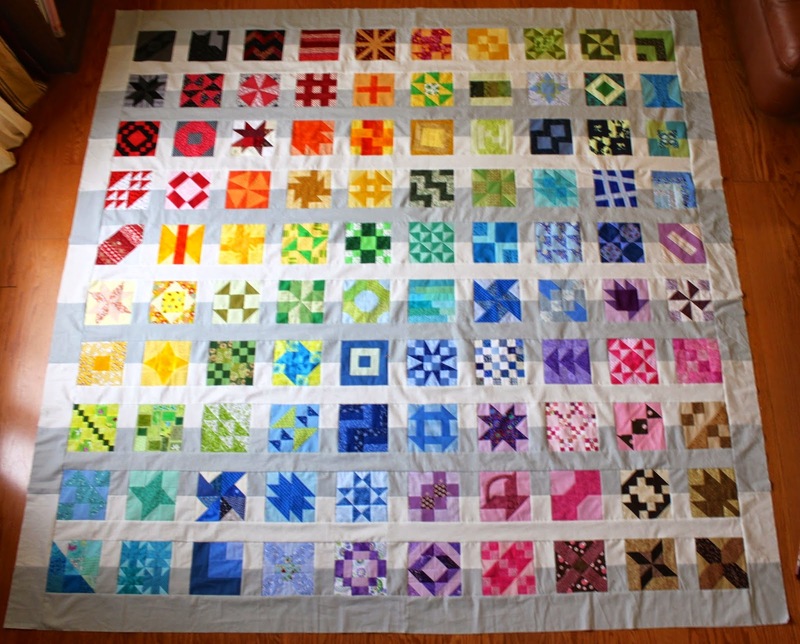 Hopefully more like this when 12 blocks have been sewn. I'm 25% of the way there. Pretty good start, right? By the time I get to the end I might even get good at curved seams! With the finish of yesterday's Rainbow Scrap Challenge 2014 Sampler Quilt, I felt free to get started on putting next year's challenge together. Oh what fun! I spent most of the day playing with fabrics, sorting them out to decide which fabrics would go with which blocks, sewing together test blocks, even planning out the sampler blocks for the year. So today I got up bright and early and started making blocks. The first month is done! So now I'm ready to start putting together the tutorials, but first, I went ahead and scheduled the color announcements for the rest of the year. Yep, there they are, the whole year's challenge colors all ready to go! So the house a mess and I have no lesson plans yet, but at least my blog is in good shape. Look what I finished today! 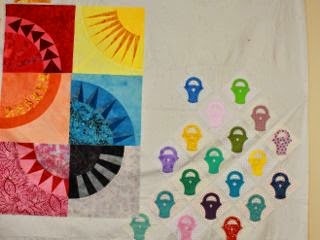 I am so happy to have the flimsy finished and have started to contemplate quilting. While contemplating though, I got started on the NEW sampler for next year. It was so much fun to start cutting into my snack pack and start choosing colors for all of the months in 2015. Oh my! What beautiful colors. I can't wait to start putting the blocks together. It is finally, officially, the last month of the year and so begins the time of finishing things up. 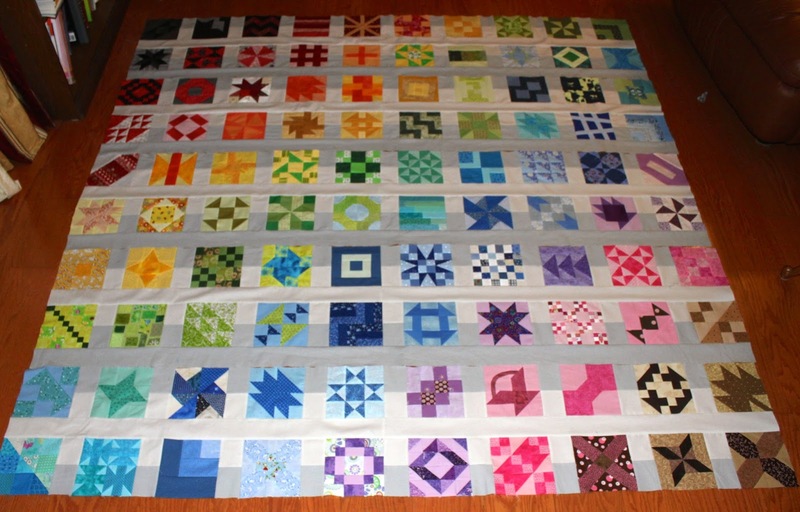 Have missing colors to catch up on, need just a few more blocks to make a top, ready to sew them all together? Now is the time to start thinking of what you can finish up this year and what you will roll over to continue for the new year. I am on to the border stages of my sampler quilt for the year and getting so excited. 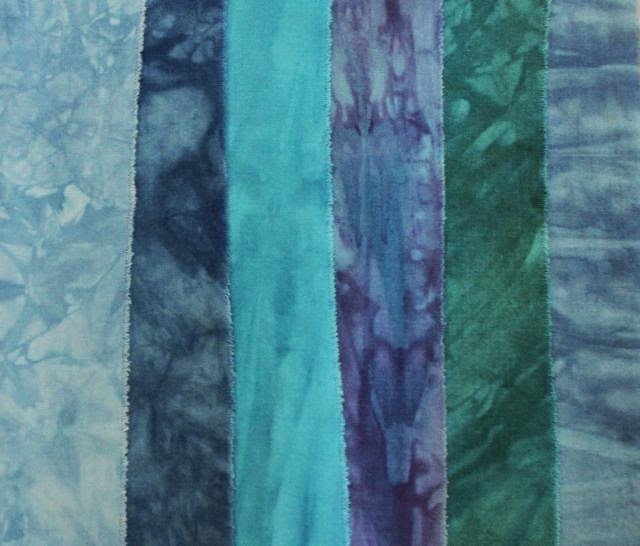 To celebrate December, I have used Random.org to chose a winner for the last 2014 bundle of hand dyed fabric from Vicki Welsh. And the winner is.... 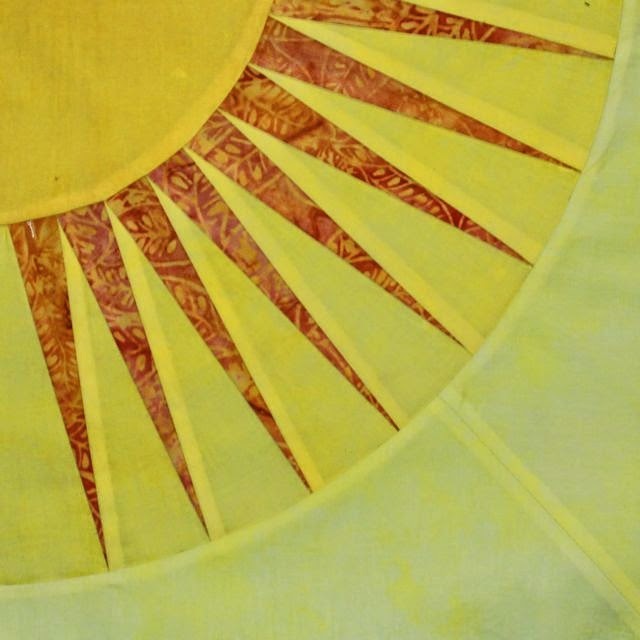 Sunny from Quilting Dreams. I've sent Sunny an e-mail and will send it off as soon as I hear back. So, as sad as it is to think about the last of the hand dyed fabric for this year going out, the idea of brand new fabrics for the new year should help ease the pain. Have you checked out Vicki's December Newsletter? She has just posted details of the Rainbow Scrap Challenge Snack Pack. It is a special collection of rainbow themed hues that we worked together to create as the basis for next years challenge colors. 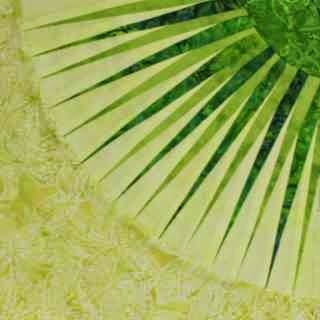 I'm designing a new quilt using these fabrics as well and will be posting tutorials throughout the new year. I must say, I am pretty excited to be continuing our collaboration for the Rainbow Scrap Challenge 2015 (RSC15). Let's not get too carried away with plans for next year though and forget to enjoy the projects we have all worked so hard on this year. Use the linky tool below to keep us posted on your progress.